I’m currently studying to finish a long-paused degree, having picked it up again after a gap of twenty years. Unfortunately, I’m a bit short of funds and so need to raise the necessaries or put the studies on hold for another year. I’m hoping to start my next course, in art history, so that I can go on and apply to study for a masters. But, I need to pay for it in a month’s time. Towards that end, I’m selling some prints at a rather reduced price. Each print is hand-printed by me on silver gelatin fibre-based paper, and toned. They are printed on 8×10" paper, so the image size is slightly smaller than that to allow for proper mounting. I will mount and window mat them, to a standard size (based on where you are, so, 12×16 inches or 30×40 centimetres, as appropriate.) They will be shipped in the first week of December, so, just in time for the holidays. $95 each, plus postage. Or £60 including registered delivery in the UK. 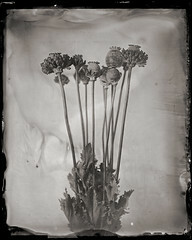 The original images are either 4×5" wet plate collodion on clear glass, or pinhole photographs on 4×5" film. Wouldn’t you like to give yourself a handmade silver print? Any questions, please just email me at slowlight@slowlight.net. This entry was posted on Tuesday, November 10th, 2009 at 10:06 pm	and is filed under general. You can follow any responses to this entry through the RSS 2.0 feed. Both comments and pings are currently closed.